It's that time again! Tea time! With all the delicious bite-sized treats you can serve, no high tea is complete without scones. 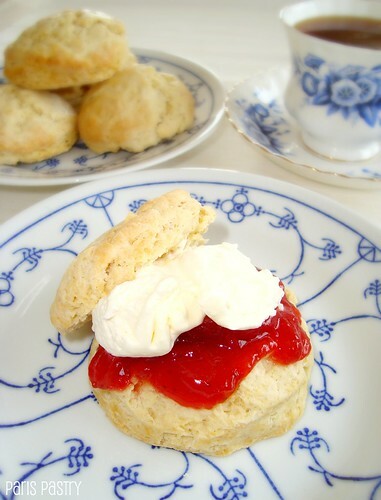 These scones are made with cream, brushed with cream and served with cream. I loved the texture of these scones; soft, but with a bite to them. And even though these were baked naked, meaning no currants or raisins, they had loads of flavor. Rating: 5 out of 5. - Preheat oven to 400 degrees. Line a baking sheet with parchment paper; set aside. - Sift flour, sugar, baking powder, and salt into a large bowl. Using a pastry blender or 2 knives, cut in butter until largest pieces are the size of small peas. - Using a fork, whisk together the cream and eggs in a large glass measuring cup. Make a well in the center of flour mixture, and pour in cream mixture. Stir lightly with fork just until the dough comes together (do not overmix). - Turn out dough onto a lightly floured work surface. With floured hands, gently pat dough into a 4 ½-by-8 ½-inch rectangle, about ¾-inch thick. Using a floured 2-inch round cutter, cut out 8 to 10 rounds, and transfer them to lined baking sheet. Brush tops with cream, and sprinkle with sugar. Bake scones until golden brown, 16 to 20 minutes. Transfer scones to wire racks, and let cool. Serve warm or at room temperature, topped with strawberry preserves and whipped cream. Cream scones are great--I love them with some lemon curd, or all alone straight from the oven! This is such a classic recipe but unfortunately I haven't mastered it yet. Your scones look 100% perfect. I make a recipe like but use Cream with lemonade, no butter. It is so simple and there is something about the combination where it all works. 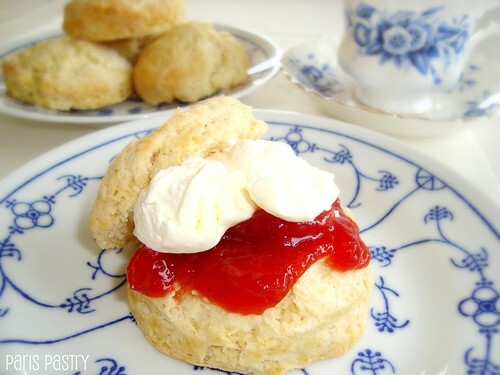 Nothing so perfect as Scones with jam and cream ----mmmmm. Cream scones are the best and these look perfect to me. Those look absolutely wonderful! With all that cream they have to be good. Oh these look fantastic! You can't be the classics when they're done right :). These look great! Haven't made scones yet, maybe I should give it a try! oh wow, these cream scones look absolutely amazing and im normally not a fan of them! theyre making me really want to try them!